As with a move, marriage, change of job, or death of a loved one, divorce is one of the pivotal life events that many of us face. As with these other changes, however, we can approach divorce in such a way to achieve a positive outcome for ourselves. 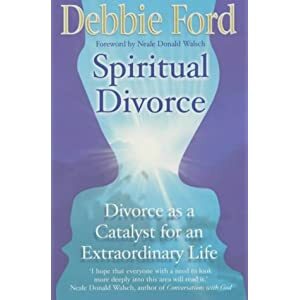 In Spiritual Divorce: Divorce as a Catalyst to an Extraordinary Life, Debbie Ford does an excellent job of mapping out the internal process for change. People deserve to know, when going through one of the most difficult events of their lives, that there is a way through the emotional turmoil that leads to peace and personal growth. She does a great job of providing examples and exercises that help discern what part we played in the dissolution of our marriages and how to own and change our perspectives so we can have resolution and compassion for our selves and our ex-spouse. Spiritual Divorce is a must read and do for those seeking healing. I invite you to call if you get stuck or need some support as you learn from the pages of this book and your own process unfolds. We can all use a helping hand, especially during the often devastating process of divorce.